Along the south coast, between Baing in the east and Wanokaka in the West, there are only occasional road links - in some cases there are only access roads from the north to the south coast. Bridges are rare, so that you cannot get through in monsoon season. People live only where the land is fertile, and you only find trucks there. Otherwise, you have to rely on your own vehicle. The first few kilometres behind Pintu Parunu show you what to expect further on. The road to the west of Baing was paved sometime, but is eroded totally, and is nearly no longer passable. 7 times you have to wade through a small river and kilometres long over rubble. The first part of track was uninhabited until recently, but now people settle here for seaweed cultures. Here you cross the nature reserve of Tanjung Ngunju. The landscape is tropical green - countless butterflies and birds flutter around you while monkeys hide in the thicket. You drive past beautiful bays and beaches, over several mountain ranges and rivers, until you see human beings again in Kakaha. 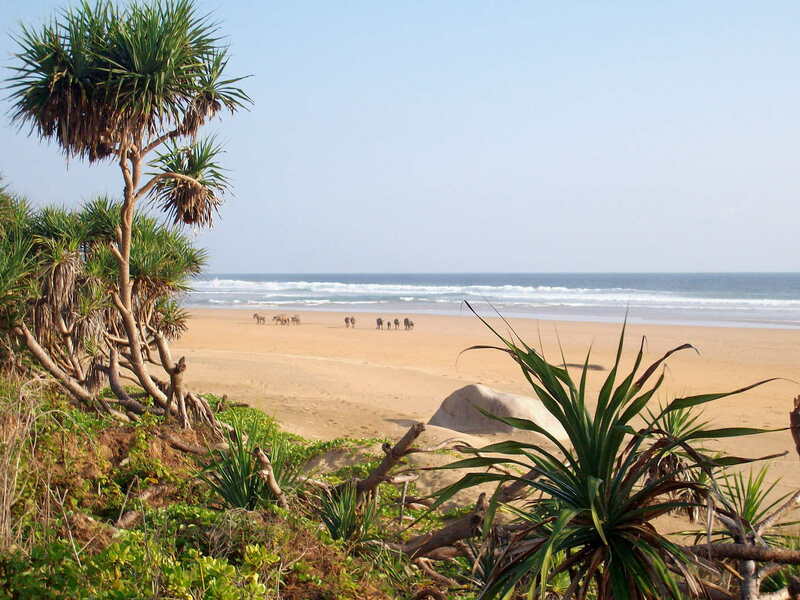 The beach of Kakaha, Manoekangga is about 10 km long, untouched, white and has fine sand. It is nice to look at, but swimming is only possible at low tide because of strong undercurrent. In this area there are no traditional villages but many new settlements. People live on fertile plains and do farming. You also get directly to Kakaha via the mountain road from Waingapu or Melolo. You also have to use this road if you want to go further west. After crossing the Nggongi River, you have to turn south to Nggongi (Ngonggi). More people live here, they are farmers and it is beautifully green. Nggongi itself lies in the flood plain and has many large wooden traditional houses and very impressive tombs. Just off the coast is the village of Lalindi. From Lalindi a small stone path leads to the river mouth and to Waihungu (Tabuati) beach. The beach is constantly shaped by the river mouth and is only suitable for swimming when the surf is moderate. From Lalindi you have a great view of the highest mountain of Sumba Palindi Wanggameti. To the mountaintop you can only get from the inland. A detailed description can be found via the link site. Starting point for this hike is Desa Wanggameti. Continuing to Tawui you dip into the jungle on the southern edge of Laiwangi Wanggameti National Park. It goes inland, past many rivers and tropical vegetation. The road is completely eroded with many dangerous steep descents. Therefore this route is often no longer used by trucks. There is only one single and new paved turn-off on the route towards the coast. 2 km down next to the river you reach Katundu. Katundu is a tiny sleepy village. It has a nice bright coral beach which is well protected by a reef. At low tide you can walk around the steep rocky walls to neighbouring bays. Once a week, there seems to be a boat to the southern offshore island of Salura. 26 Families or 660 Muslim People live there. The neighbouring Manggudu Island is uninhabited. There was a surfing resort. It was vacated by the Indonesian army because of contentions between Mr. David and the Indonesian administration. Since that time it is prohibited to enter the island. A very new and informative blog about Salura can be found on the link site. Back to the main line the road leads over a stone beach to Lailunggi (Lai Tunggi). Here end the trucks coming from Waingapu via the road to Tarimbang, Wahang, and Tawui or the other way around over Kananggar Nggongi. Lailunggi is located in the plain of the Bokul and Watumbelar River. All around are agricultural areas. The beach of Lailunggi is mostly rocky. But at low tide you will find some sandy areas and with moderate surf you can swim quite safely. The shortest route from Waingapu to Lailunggi is via Tanarara, Desa Wanggameti, Katikuwai, Ramuk, and past the mountain village of Mahaniwa. The road is good only in the area of the gold mining project. Trucks go as far as Ramuk. From Ramuk to Lailunggi it is more a mountain trail than a road – maybe passable by Motorbike. In the plain the way ends like a river bed. In the rainy season this part of the way is difficult to make - even for hikers. On the way 3 rivers and many creeks have to be crossed. Sometimes crossing is not possible without help. Nevertheless, the route through the mountains of the Laiwangi Wanggameti National Park is uniquely beautiful. Traditional villages are stuck picturesquely on the slopes and you have a magnificent view of the mountains overgrown with green jungle. One option would therefore be to drive up to Ramuk by truck and hike the remaining 13 km with a descent of 700 meters. Another option would be to hike from Ramuk via Mahaniwa and Waikanabu to the region of Karita at the road Tarimbang – Wahang. This is an unexplored way of about a 22 km with an ascent of 500 meter, partly through jungle; therefore you absolutely need a guide. The Kanabuwai waterfall is about half way (either from Mahaniwa or Waikanabu it could be 4 hours). 6 km west of Lailunggi you reach the village and most beautiful beach of Sumba, Tawui. The beach is almost 8 km long and sometimes up to 200 meters wide. It consists of almost white fine sandy material. There is strong but steady surf mostly parallel to the beach. In some places, especially at the 2 ends of the beach, there are rocks in the water, which may be covered at high tide. Apart from water buffaloes and Sumba horses no one bathes in Tawui. The beach is reached via narrow trails leading through fields of fragrant spice bushes. Several small settlements and the district administration lie behind the beach. If you walk over the cliffs to the east, you have a breath-taking panorama, and ultimately come to a bay for fishing boats. If you walk inland, you pass many farms and fields. Some small traditional settlements are in this area. One of these ways begins to the right of the primary school. It leads into a 2015 newly built dangerously narrow and steep motorcycle path. It leads up to the mountains with great views, to the small waterfall Cengkeh, and ends at Laitaku. In the last part, it is more of a trail. You can achieve Laitaku also from Lailunggi via Wanggabewa, first with motorcycle, and finally 3 km walk along the river. From Laitaku you can reach the impressive Kahalatau waterfall hidden deep in the jungle in a two hour's walk. It is worth seeing mainly in the rainy season but the way there is than more difficult. Kahalatau is often not known by locals, they refer to Cengkeh. Maybe there is someone from the local national park administration "Tawuiresort" in Tawui, who knows the way there. The road to the west has been repaired at most of the steep ascents. The village of Wahang is at the next bay and has only a small beach. Wahang winds far inland along the river. With increasing altitude, the landscape becomes more tropical. After about 5 km the houses end and the road leads through primary tropical forest. Here it dips again into Laiwangi Wanggameti National Park. Before it goes down a small path branches off eastwards to the upper part of the waterfall Laputi (Laiputi). Here is an orphaned picnic area, a small jungle lake and you have a beautiful view over the valley. A little further, at the beginning of the village, turn eastwards to the foot of the waterfall, this is about 1 km away. Even in the monsoon season, there isn't a lot of water but its height of 100 meters and the lush greenery around are quite impressive. Back on the main road, it is 500 meters to the traditional village of Praingkareha. About 3 km from Praingkareha before a curve an access road forks to the southwest. It is partly new asphalted and ends abrupt at a river crossing. Just a few hundred meters before, a jungle trail leads after 500 meter northwest to the Laindamuki (Laluku) waterfall. There are definitely crocodiles and snakes, please be careful! The road then goes further down to the village of Pindu Hurani and the coast, but is not really passable. Above the coast you can reach some traditional villages by foot. The beach is not really suitable for bathing because of the strong undercurrent. Alternatively, you can reach this area in a day hike from Tarimbang. From Praingkareha the road goes inland along the river. You see many new settlement areas, relatively large and prosperous villages, and fields everywhere. In the village Billa shortly before the river bridge a road branches off to the east. It meanders through gorgeous green river valleys and over green hills past the traditional village Watubakul to Waikanabu. Then it ends in small paths. Another branch leads, where the main road turns to the west, along the north bank of the river until Kukitalu. At the end of both side roads are paths to the northeast across the uninhabited highlands. After about 15 km and 500 meters ascent these paths end at Kambaniru River. From the east bank of the river at Maidang begins a road that leads to Waingapu. The main road however winds around this less inhabited interior part of the island for kilometres around Alang grass covered hills, until it meets at last the Praipaha Tarimbang road at Simpang Tabundung. In Tarimbang you will see tourists again. Mainly surfers go to Tarimbang because of the legendary wave "Millers Right". But the bay is also famous because of its natural beauty: semi-circular with a diameter of 2 km, beautiful surf and clear water, surrounded by rocks and tropical vegetation. This bay is unique - hopefully it will not be filled up with hotel castles. The village lies at the mouth of a river delta. In the plain you don't need a guide. In the dry season, distances are short - in the monsoon season you must walk around the fields and meanders of the river. Upstream are several Marapu villages and a dam, which is used to regulate the irrigation of the delta. A little further there is the waterfall Kabubul, and finally the way goes uphill and leads back to the main road. You can only reach the adjoining bays with a guide, as the jungle is too confusing. To the east you reach Pindu Hurani and other beautiful original and traditional villages (cf. above) within a few hours. To the west Mambang bay can be reached in a few hours. It is also one of the most beautiful bays and beaches of Sumba. Mambang bay is also accessible by a path from Praibakul to Kambaru (cf. below). Tarimbang can be reached directly from Waingapu or Waikabubak, when you leave the connecting road between the 2 towns at the village of Praipaha (km 47) and then turn to the south opposite the telephone mast. You must also return there if you want to go to one of the 2 main towns. Some trucks do not drive down to Tarimbang but turn 10 km before, at Simpang Tabundung, in direction Tawui and Lailunggi. West of the Praipaha Tarimbang road there are some new settlement areas. On the Tarimbang road, in Lailara, a recently built road branches there. This road leads also to the traditional village of Praibakul. The road ends before a circular gravel road of a new settlement. Behind circle is a way, which had been prepared a long time ago. It goes to the beautiful white sand beach Kambaru (Kambaroe, Kakadu, Kakadoe, Lakakadung). Since shortly now this route is occasionally used by fishermen with motorcycles, so that it is almost free of vegetation and easy to identify. The distance to the beach is 11 km with a descent of 400 m. The beach has pleasant surf and is surrounded by tropical greenery. The continuing way to Mambang is only possible on foot. Until there it is only 3 km with 150 altitude meters, but it is difficult to identify. Both beaches and the jungle around are uninhabited. Sometimes fishermen spend the night there. From Mambang to Tarimbang it would be in addition 7 km with 200 altitude meters. All in all, this would be a 2-day tour, which should not be done alone. Praipaha on the road Waingapu- Waikabubak is the last major town in the northern direction. Roads further to the north end when settlements end - depending on the season in a beautifully green or brown hilly landscape. We continue westwards: The point 7 km before Lewa behind a hill and before a house is important for birdwatchers: There a path branches off towards the south. At another junction you must keep to the left. Then you dive into a jungle valley with many clearings. This is the place where birdwatchers claim that you can see all the endemic birds of Sumba. 2 km further a road branches off to the north and leads to some natural lakes like Lairini and several others, nestling between rounded limestone hills. Along the densely covered banks many birds can be seen. For non-birdwatchers both locations are worth visiting because of their scenic beauty. The best time for birdwatching is (too) early in the morning and at dusk. Back to the road Waingapu- Waikabubak, the next town west is Lewa. Lewa is only a transit point and offers hardly any tourist attractions. The Lewa plain is a great agricultural area. A long time ago, the first villages of transmigration programs were created here. If you turn south at the sign Tanarara at the eastern entrance of town, or at the sign Kangeli 1 km west of the gas station, you come to the southern plateau. There are also some traditional settlements on the way. The road then finally drops down to the coast to the village of Mondulambi (Omatena). Rice is grown around the irrigated Tidas River delta. The amount of water is enough for 2 harvests per year. Everything is beautifully green. From the village to Mondu (Tidas, Kiriwei) beach it is another 5 km along the river delta and mangrove forest. Monkeys, birds, and butterflies will accompany you. The beach is characterized by a shallow estuary. Depending on the tide the water reaches up to the mangroves or is up to 300 meters wide with white and fine sand. When there aren’t any high waves you can swim everywhere; otherwise you have to be careful. Lewa is located on the eastern edge of Manupeu Tanah Daru (Tanadaru) National Park. Here is another paradise for birdwatchers and it is also worth visiting for nature lovers. You must pay an admission fee for the national park and you need a guide who accompanies you. The National Park Office Kantor Wilayah SPTN is the building with the blue roof in the middle of the field southwest of the bridge. Here (or as a download on the Internet) you can also get a detailed brochure about flora, fauna, waterfalls, beaches, and caves in the park. Destinations within the park include Watumbelar, about 20 km south of Lewa. Here you can hike deep into the jungle. The knowledgeable guides show you the birds you can hear, on the display of their mobile phones. Or they play the bird calls in order to attract birds. On the way to Langgaliru, 6 km west you can already see birds from the road and visit an abandoned village and a Marapu sacrificial place in the jungle. A gruelling 2-day tour takes you across the park to the south coast to the beaches of Laitucu and Otur. One of the highlights of this park is the easily accessible meteorite impact, Dampak Meteor (Jatuh Meteor). The meteor has stamped a crater 150 meters in diameter into the earth and exposed an underground river in the limestone. This river emerges from a cave on one crater wall and disappears into the floor at the other side of the crater. In the dry season you can descend into the 80 meter deep crater. The trail to the crater begins exactly opposite the milestone LGR km 8 - through Alang grass. Some people claim it is only a karst sinkhole, and no meteorite impact. Whatever the thing is impressive in any case. 9 km north of Lewa at Rakawatu is the lake Danau Rini. After monsoon season, it measures up to 75 hectares. During this time, hundreds of Australian pelicans nest here. By the end of the dry season the water level decreases up to 6 meters and the lake shrink to a small pond. Shortly after crossing the eastern part of Manupeu Tanah Daru National Park at Langgaliru the administrative district of East Sumba ends.